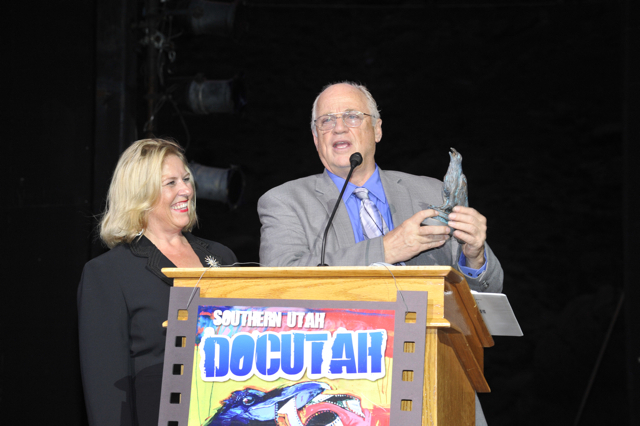 SOUTHERN UTAH – In association with Dixie State College of Utah, the DOCUTAH Southern Utah International Documentary Film Festival returns to Southern Utah theaters Sept. 5-9 with outdoor opening night festivities planned at the DSC Encampment Mall. Beginning at 7:45 p.m. Wed., Sept. 5, DOCUTAH will present an outdoor performance by Calamity Dance Company before kicking off with a starlight screening of “Hip Hop Maestro.” Free and open to the public, the 40-minute film celebrating music and dance will be followed by a presentation from Dixie STORM Radio and an outdoor dance party hosted by Zumba enthusiasts and instructors April and Dahlia Keil. Following opening night will be a solid schedule of documentary film screenings with feature events highlighting artists, humanitarians, athletes, musicians, and various social issues. Thurday, Sept. 5, will highlight local artist Matt Clark, sculptor of “Painted Pony.” Clark’s works will be on display at the Dolores Dore’ Eccles Fine Arts Center at DSC throughout the festival. On Friday, Sept. 7, the films “Awaken the Dragon” and “Running Through” will feature athletes who have overcome extraordinary odds to achieve success and happiness. During the five-day event, theaters in St. George and Kanab will screen top-rated documentary films with special events and screening parties at a variety of venues. The Festival will close Sunday, Sept. 9 with a celebration of filmmakers and Raven Awards ceremony at 7 p.m. at the Megaplex Red Cliffs Theatres in St. George. A unique feature of the DOCUTAH festival is its dedication to education. Each day of the festival, seminar and panel discussions will be held by filmmakers and industry experts. Seminars will take place Wednesday through Saturday from 1–4 p.m. in the Sears Art Museum Gallery, with student films presented in the same venue following. To add to the educational flavor, Q-and-A sessions have been scheduled. Following many film premiers, viewers will have the opportunity to engage in question and answer sessions with movie producers, directors, field experts and academicians. The DOCUTAH International Film Festival originated at Dixie State College in 2010. The Festival has since put Southern Utah on the map for hosting this event that attracts professional, amateur and student filmmakers each fall. Festival-goers enjoy coming for the films, staying for the scenery and departing having experienced documentary film inspiration. Touted by the Public Broadcasting System as one of the nation’s best “Small-Town Documentary Film Festivals for 2012,” this year’s festival will showcase the best of a record-348 submissions from 46 world countries. Of these, 67 professional and 41 student films will screen during the five-day festival. As part of the festival’s ongoing commitment to provide quality exposure to meaningful documentary films, DOCUTAH now offers year-round screening events to Southern Utah communities. The September Festival serves as the organization’s culminating annual event. Stay tuned for information on upcoming DOCUTAH events. Participating screening venues include: Dolores Dore’ Eccles Fine Arts Center Mainstage Theater and Sears Art Museum Gallery, both at Dixie State College; the Red Mountain Resort in Ivins; Jazzy Java (Jazzy’s Rock ‘n Roll Grill), 13th & Park Art Space, and Megaplex Red Cliffs Theatres, in St. George; and the Crescent Moon Theatre in Kanab. 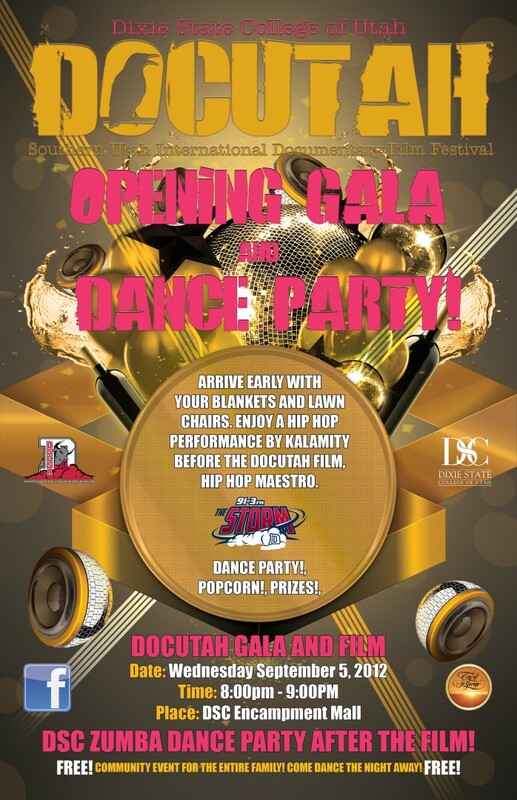 Tickets can be purchased at screening venues, at the Dixie State College Box Office or the Dixie State Box Office online. Cost is $5 for a day pass or $20 for an all-event pass. For more information, call 435-879-4273 or visit DOCUTAH online. I approve of Matt Clark. I disapprove of intentional misspellings such as ‘Kalamity’ and will avoid the dance event because of this.